We just wanted to let you know what a wonderful experience we had with your “Dream Scooter” on our Vacation at Walt Disney World. Your scooter company made our first family vacation in years one to truely remember! As usual your service was fantastic. Certainly appreciated the returning customer discount. 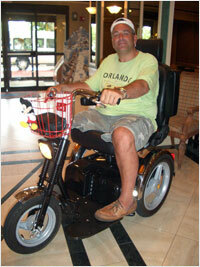 I will definitely rent from you again should I return to a convention in Orlando. Except for the first when the “scooter bug” hit, my experience with your scooter and people was fantastic. The dream scooter was there when promised and even though it was a one-day rental, it saved the day for me! I have in the past rented on site scooters and wished I hadn’t as they weren’t comfortable at all. 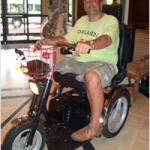 I would absolutely recommend your company for a scooter rental when vacationing in Orlando at Disney World. I am writing to let you know that my use of the Dream scooter surpassed all my expectations during my 11 day vacation this past September. I’ve had to use scooters from other companies before, due to back injuries and they do not compare to this last experience.